The first blue Vanda was discovered in 1837 on Gordonia trees in the oak and pine forests of the Khasi Hills in India, and described in 1847 by William Griffith as Vanda Coerulea. Though the first flower unfolded in England in 1850, the great, great grand daughter of the Queen has been blooming since it was created in Singapore in the 1960's. Princess Mikasa Blue is the epitome of grace, luxury and high style. 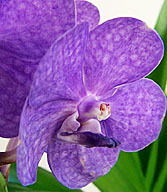 This orchid is an excellent accessory anywhere in your home and an unforgetable gift to anyone important. 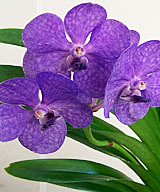 The blue flowers are approximately 10-13 inches tall and shipped with 4-6 flowers, which will bloom for up to 4-5 weeks. The blooms measure 1.5 t0 2 inches in diameter. 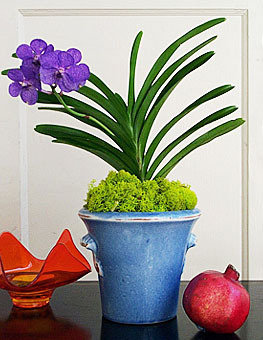 Sublimely simple, this Italian terra-cotta glazed orchid pot is a perfect counterpoint to accentuate this blue orchid. The 6" tall orchid pot is crafted individually in a rustic style. View pot for details or choose below. Each purchase includes care instructions and an exquisite gift card for your personal message--only from Beautiful Orchids.